Recognized as one of the best camps in the camping industry, Camp Cedar is family-owned and run. We offer a warm and comfortable learning environment with an emphasis on human relations combined with athletic, creative, adventure and water based activities. We welcome individuals from all religious, ethnic and cultural backgrounds who have an interest in working with kids, a sense of adventure and fun and the ability to serve as excellent role models for our boys. Staff orientation begins on June 14th. Some staff are contracted to stay until August 15th to work with a post-camp inner city camper group. Our male and female staff come from all over the United States, Canada and abroad. Ages range from 18 years old and up with an average age of 22. Many of our staff returns year after year. As diverse as our staff is in background, they all share enthusiasm and a genuine interest in working with kids. We pride ourselves on creating a work environment that generates a happy and fulfilled staff. Our cabins or bunks are freestanding wooden structures with electricity and plumbing. Each bunk has approximately 8-14 campers and 2-5 counselors (depending on the age of the boys). Male counselors live and sleep in the bunk with the boys. Female counselors sleep in their own separate cabin. There are 3 meals provided daily along with both an afternoon and evening snack. Weekly on campus laundry service is provided for staff. There is a staff lounge with phones, computer email access, cable TV and DVD. At Cedar, we offer a full program of activities ranging from individual and team sports such as basketball, baseball, soccer, hockey, lacrosse, tennis, volleyball, swimming, biking, sailing, water-skiing and golf to outdoor education and adventure programming including hiking, nature, trips, zip line and ropes course as well as a full slate of creative arts programming. The younger campers have a structured program that ensures their experience is as diverse as possible. As the campers get older, they have the opportunity to choose areas they wish to focus on. The program includes instructional periods, practices and competitions. 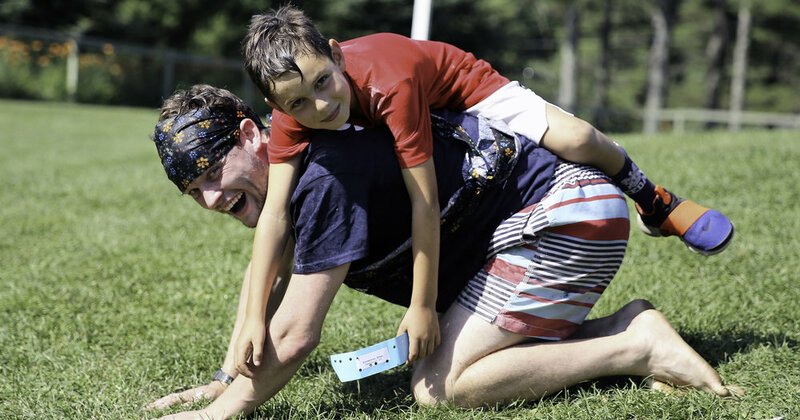 Depending upon the activity, there are frequent inter-camp games that provide counselors the opportunity to coach and referee as well as teach. Cedar’s facility is second-to-none. The camp has 9 basketball courts, 12 tennis courts, 2 baseball fields, 2 roller hockey rinks (one lighted), golf center with a driving range and par 3 course, lighted soccer field, lacrosse field, high and low ropes course, zip line, 60 foot climbing tower, indoor climbing gym, waterfront with 3 swimming areas and a float, sailboats, water ski boats, canoes, BMX bike course, miles of mountain biking trails, beach volleyball courts, darkroom, lodge for rainy day activities and dances, crafts facility, tetherball, ping pong tables, weight room, archery range and the most beautiful hardwood indoor gymnasium and stage you’ve ever seen. Activity Period - Typically, these morning activity periods will involve instruction at a variety of skill levels. Campers get to take a break and, typically, so do counselors. Activity Period / Inter-Camp Competition - This is often a time for competitions with other camps for those who coach teams or referee. This can also be another period for activities. Optional Period - Most campers have their choice of activity to go to during this period. This period is great for one-on-one instruction, pickup games or team practices. Bunk Activity / Intra-Camp League Games - This is typically a time for activities specifically with a bunk and may be scheduled for intra-camp league play. Evening leagues are held about once a week. Talent show, game show, movie, etc. We understand that the counselor role is demanding and in order to maintain the highest performance, counselors and staff must have time to recharge. There are 4 scheduled days off during the summer and regular evenings off. Support staff have a slightly different days off routine. Regularly scheduled intra and inter-camp counselor competitions in basketball, soccer, roller hockey, tennis and volleyball provide a competitive outlet for those inclined. There is also a staff lounge with phones, email access, TV and XBox for off-duty staff. The weight room may be used during leisure time as can any of the camp facilities when properly supervised. There are several other very important jobs around camp. In addition to counselor positions, there are available positions in office/reception, bookkeeping, nursing, nanny, kitchen and maintenance. Please inquire regarding these positions if interested.